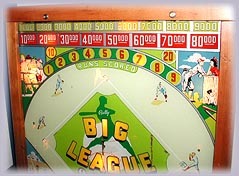 Here is my 1946 Bally Big League game, as it sits next to the Darts pinball game. It is a woodrail pre-flipper pinball, where nudging the machine becomes an art form. Flippers would be introduced the following year, and pre-flipper games like this one quickly fell out of favor, and were either retro-fitted with flippers by operators or just taken off route (often simply being discarded). This is only the second pinball machine made by Bally after the war; and even then they didn't make many pins for awhile after this one, only releasing fewer than a dozen titles before really picking up pinball again in 1957. They preferred to concentrate on horserace payout games and bingo machines during this period. This was a project machine that took about seven weeks of intensive work to restore. I picked this up on December 9, 2002 and began work on it immediately (that same day, in fact). By late January I had it to a point where I could actually bring it in the house and assemble it, and after a few days of working with the mechanics, I finally got it working 100%. It was finally completed on January 31, 2003. Even though there's no flippers, it's quite a bit of fun! Here is the playfield for the game. 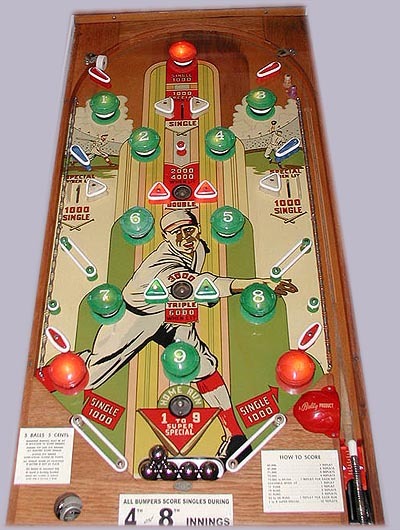 The playfield artwork on this unit is nearly perfect, with very slight wear only in the vicinity of the "Triple" saucer. 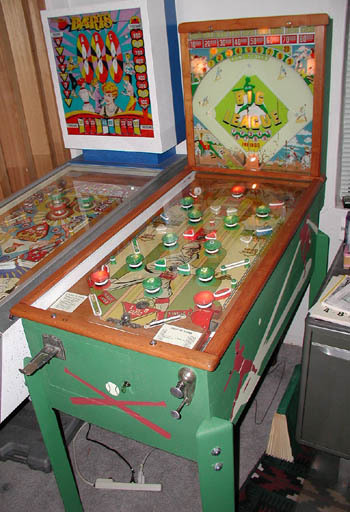 Some of the features on this playfield date the machine in the 1940's: The undulating springs up and down the left and right sides of the playfield; the triangular and flipper-shaped plastic playfield pieces (with feature lamps beneath); bumpers that serve the purpose of scoring only (these are not pop bumpers, pop bumpers hadn't been invented yet either! ); the tray at the bottom of the playfield to collect the balls played; and the hole in the lower left of the apron to let the player see the nickel he just spent! And, of course, there are no flippers... Also, notice that there are no plastic playfield inserts. 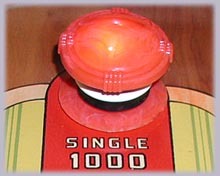 All of the feature lamps are on top of the playfield. These old games were small (-ish)! The playing field sits fairly high, but the backbox sits right at the level of the playfield glass, and its quite a bit shorter and narrower than the playfield. It makes modern machines (particularly the behemoths of the '70s and '80s) seem massive. The top of the Big League backbox is a mere 64", while the top of the High Speed beacon towers at 79"! The backbox is 10" narrower, too. Amazingly, the size of the playfield glass has remained the same; I was able to replace the glass with the standard modern size. Macines of this era are characterized by lots of wood, both finished and painted. This particular unit has the finished rails, the backbox frame, and the beautiful finished oak apron. 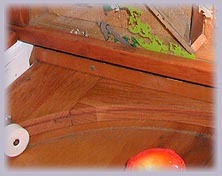 Some of the playfield (near the top) is unpainted wood as well; something that is not much seen in modern machines. They also have the wooden legs, which can come in a variety of shapes. This machine has triangular-shaped legs; one of the more scarce types. All of the wood in this machine was re-finished in restoration, and it came out quite well! As mentioned above, these are not pop bumpers, but scoring bumpers. They are ultra-sensitive; the slightest ball hit will trigger a score. They are all fitted with snug white rubber rings, so they have a fair amount of spring action off of them. Nudging the game at just the right moment can really make a difference! * The small painted wooden coin door. 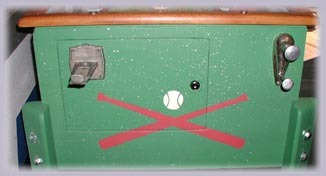 This is a removable coin door, with no hinges. * Nickel coin slide. No coin chutes with a coin return here. * No start button. These old games started up when a nickel was inserted. * Ball lift lever; which is integrated with the plunger. This isn't an exclusive feature of pre-flipper games necessarily, but it does represent one of the earliest scoring themes. My Darts machine has the same type of scoring. But this one doesn't even have the reel-type display for credits, but it uses the old projector method.